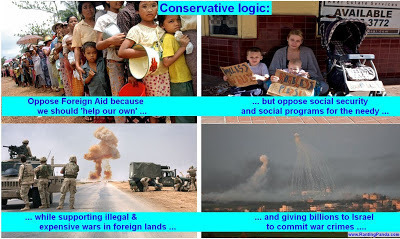 Conservatives are very vocal about the amount of money 'wasted' on Foreign Aid, regardless of whether it is for humanitarian or developmental purposes. The logic behind this opposition is that there are needs in our own country that should be met first. So far, this logic actually has some merit. There are needs in our own country which should be met. However, the logic falls apart the moment that said Conservative opposes addressing those needs, for instance, through social security, or socialised health, housing and educational programs. The logic develops an even greater flaw when said Conservative is more than happy to see trillions of dollars wasted on illegal and expensive wars, such as Iraq and Afghanistan which have dragged on for a decade and killed hundreds of thousands of innocent people. Additionally, the borrowing of over a trillion dollars to fund these wars has greatly contributed to the economic demise of the United States. The logic is fatally flawed when Conservatives support providing billions of dollars to Israel to commit war crimes in the Occupied Palestinian Territories, such as killing and maiming civilians by attacking them with white phosphorous and depleted uranium, or continuing the construction of illegal settlements which breach the Fourth Geneva Convention, let alone the ongoing construction of the apartheid wall which imprisons Palestinians and prevents them from accessing hospitals, schools, jobs and their own farmland. Wealthier nations should be providing foreign aid AND social security to assist in making people's lives better, rather than funding the destruction of people's lives.